Let’s show the part of Niagara Falls in New York. 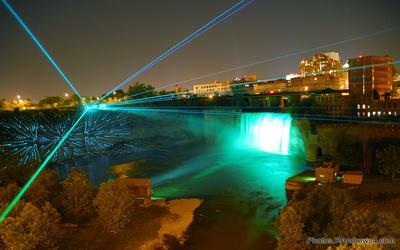 High Falls in Rochester should also make the list. I can’t argue with Niagara Falls as the top waterfall in State of New York. This is one of the top waterfalls in the world. Your photo was taken from New York, but it shows the Horseshoe Falls which are in Ontario. 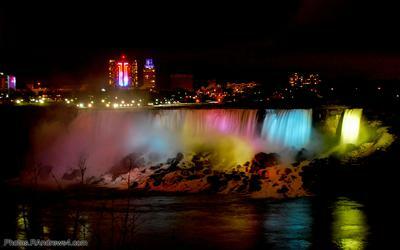 At night the American Falls are the star because the Horseshoe Falls are largely obscured by mist. 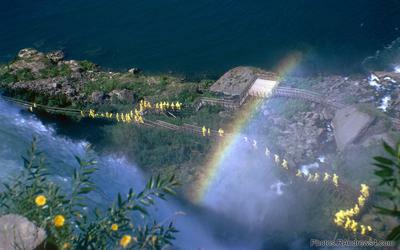 I’ve always enjoyed the American Falls and Bridal Veli Falls because you can get closer to the water. I would have included the High Falls in Rochester. This is a classic plunge waterfall with a deep pool underneath. There are a couple automobiles and a railroad locomotive below the surface. This was the heart of the city in the 1800s when it was the Flour City. In the 1900s Eastman Kodak, Rochester Gas and Electric, and the Genesee Brewery surrounded the waterfall. In the 2000s the Kodak Office is now largely empty. Only the hydro-power station remains for RG&E. The Brewery is still going strong.